Friday September 20th 1901 I did baking and got things fixed for dinner as I expected Aunt Ellen and Lib. They did not come but Lib came for Mollie. The folks were all out for a call in the afternoon. We got my room papered in spite of interruptions, it is pretty. 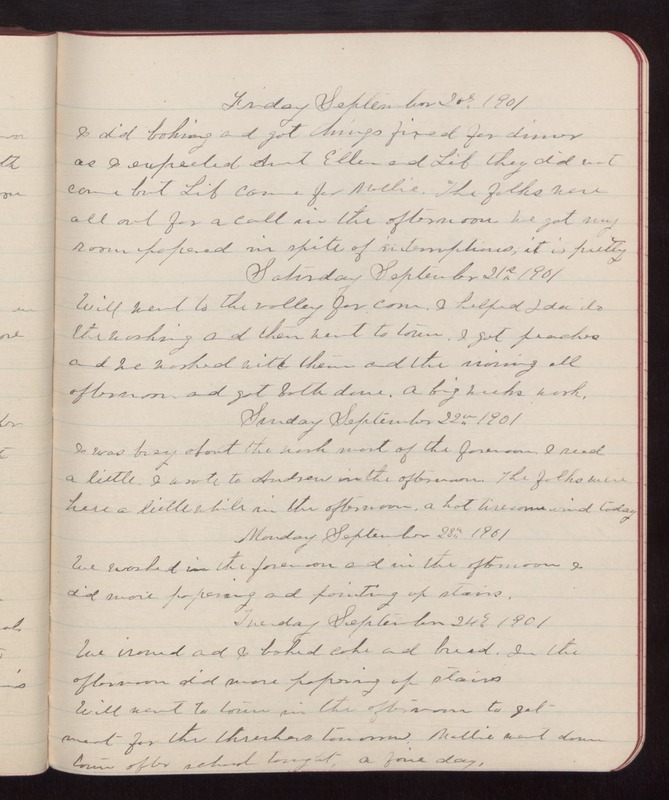 Saturday September 21st 1901 Will went to the valley for corn. I helped Ida do the washing and then went to town. I got peaches and we worked with them and the ironing all afternoon and got both done. A big weeks work. Sunday September 22nd 1901 I was busy about the work most of the forenoon. I read a little. I wrote to Andrew in the afternoon. The folks were here a little while in the afternoon. a hot tiresome wind today. Monday September 29th 1901 We worked in the forenoon and in the afternoon I did more papering and painting up stairs. Tuesday September 24th 1901 We ironed and I baked cake and bread. In the afternoon did more papering up stairs. Will went to town in the afternoon to get meat for the threshers tomorrow. Mollie went down town after school tonight, a fine day.